Like the Nov. 30 show, the program will focus on how to use astrology to create your perfect holiday decor. 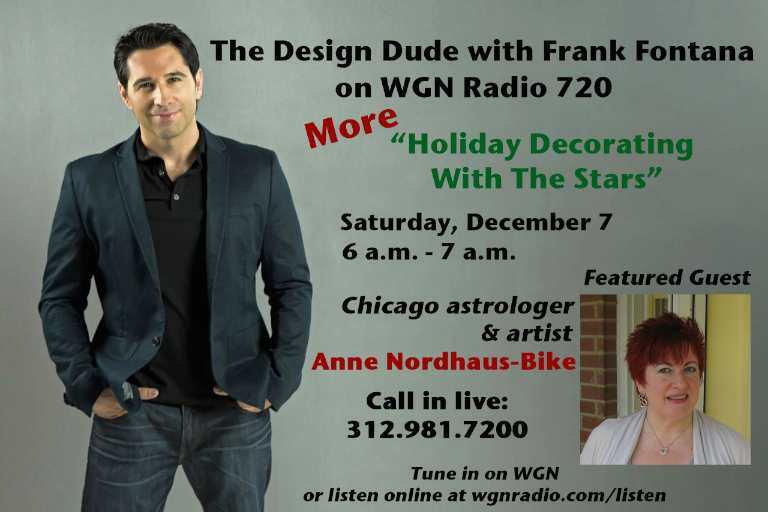 Nordhaus-Bike and Fontana will talk about how your Sun sign can help you make great design choices as you prepare for the holidays. They also will look at Sagittarius and Capricorn, because the Sun moves through these two signs during the end of fall and beginning of winter, when so many cultures celebrate major holidays. They’ll share how everyone—whatever their Sun sign—can use these two signs’ energies to make the most of this festive time of year and avoid overdoing and overspending. Hear the show by tuning in WGN Radio at AM 720 in Chicago. Or listen online from anywhere in the world by going to http://wgnradio.com/listen/.